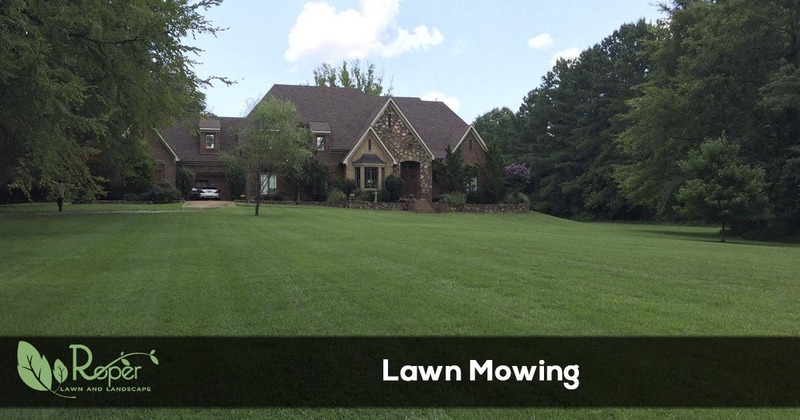 For affordable lawn mowing services in the Memphis, Germantown, Cordova, Collierville, Bartlett, Lakeland and the Arlington Tennessee area call Roper Lawn & Landscape. Living in Memphis, TN, means good times are right around the corner. But one thing that’s harder to find is quality landscaping services. Even something as simple as dependable lawn mowing feels impossible to hire. Whether a service provider charges too much or just isn’t reliable, you need a complete landscaping team you can trust. For the best option in local grass cutting, as well as full-service yard care, you can always depend on Roper Lawn & Landscape. We achieve the results that other companies can’t! We offer affordable lawn mowing whenever you need us. From one-time overgrown yard service to monthly maintenance solutions, we offer it all for less! Call today for your best grass cutting services, as well as all other solutions for your yard. We guarantee better results fast each time you choose us! Many homeowners choose to cut their grass themselves. But the moment their lawn mower experiences problems, they’re likely stuck with tall grass and a ton of frustration. While maintaining your home’s lawns may sound like a simple way to cut back on maintenance expenses, it pays to hire a professional to handle your grass. They know how to get through your yards faster and with better results. When you choose us, we promise quick grass cutting that achieves a professionally manicured appearance. We’ve handled local landscaping needs for numerous homes in the area, and we can’t wait to assist your yards! If you can’t seem to get the smooth look of manicured lawns, then you need our team to help you. Let us make your yards look their best for less each month! Mowing grass appears simple enough. But choosing the right mower, storing it correctly, and ensuring you keep enough gas on hand soon make it a complicated chore. And just like with vehicles, over time your mower requires new spark plugs, oil, and air filters. But the average homeowner is not going to go for the expenses of maintaining their machinery. Instead, you could just allow us to offer our best quality mowing for less. We offer full landscaping solutions at affordable pricing to ensure you get the care your grass deserves. Whether you own an aging lawn mower that just doesn’t cut it anymore, or you can’t stomach the price tag of newer models, you can save a ton by choosing us. Let us give you your best yards every month! Taking on your yard care yourself becomes an expensive and time-consuming commitment. Rather than waste every weekend working out back, we can help maintain your yards the simple way. Choose Roper Lawn & Landscape for the best in affordable grass cutting solutions. We care for your yards like they were ours! For fast, dependable service and lower pricing, you can always rely on us to handle your yards. Call today for your best grass mowing services and save! Ready to schedule your lawn mowing services or just need to get a quote? Give us a call at 901-290-8165 or request a quote online. We give quotes fast and make scheduling easy.